Total-Zymes and Total- Biotics maximize the nutrients your dog receives from food and strengthens digestion for a healthier dog. What sets K9Medicinals.com Apart From Competitors? 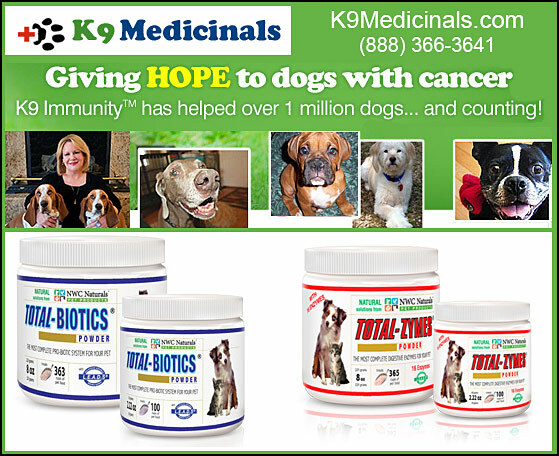 K9 Medicinals is a family business, who started selling these products after our own dog was diagnosed with cancer and given two weeks to live. K9Immunity extended our dog’s life by two years. We are passionate about helping others going through this trauma and want to keep healthy dogs well so no family has to go through what we did. All of our products are made in the U.S.A. and all of the ingredients are made in the U.S.A. as well. They are formulated in FDA certified laboratories to human grade standards. They are safe, organic, natural and have no known interactions with any other supplement or medication. They are safe for even pregnant or nursing canine mothers. Some other companies advertise their products are made in the U.S.A., but the ingredients come from other countries who have no safety standards. We have a full money back guarantee and a wonderful support system for our customers and their canine family members. Total-Biotics provides the most comprehensive array of beneficial bacteria to strengthen your dog’s digestion. In turn, a healthier digestion promotes a stronger immune system. Probiotics are essentially living bacteria – the kind that are good for your health and grow naturally in your digestive system. As you may know, the digestive tract contains both good and bad bacteria. When the good bacteria are in balance, they keep the bad bacteria at low levels. When in balance, beneficial bacteria also help your dog flush out toxins and absorb nutrients from food. Total-Biotics contains 11 stabilized probiotic strains. That’s nearly ten times the number of strains as other formulas! And because they’re stabilized, your probiotics are guaranteed active. Most other probiotic supplements aren’t very effective because a significant portion of the bacteria die off during the manufacturing process or during shipping. Instead, Total-Biotics supplies 500 million CFUs in each dose, so your dog receives the critical digestive support needed for health. Why Does My Dog Need Digestive Support? What Are The Benefits? A dog weighing 65-70 pounds needs up to 1.5 pounds of beneficial bacteria in its gut to protect against disease and illness. But with age and modern pet food, it’s easy for the bad bacteria to grow so rapidly, they overtake the digestive system and cause health problems. For example, every time your dog drinks chlorinated water, eats pet food containing meat treated with antibiotics, become ill or stressed…it allows bad bacteria to multiply unchecked. As the bad bacteria continue spreading in your dog’s gut, they prevent him from eliminating toxins and absorbing nutrients from food. Before long, these toxins seep into the bloodstream, which can cause further health issues. Total-Zymes® is the most complete digestive enzyme available for dogs. It contains a proprietary blend of 14 different vegetarian enzymes. And it includes the patented L.E.A.D.® system to guarantee the nutrients in the formula are absorbed and utilized at the cellular level. Why Does My Dog Need Digestive Enzymes? Your dog’s body produces digestive enzymes, but as he ages, his production naturally slows. This makes it difficult for him to break down and absorb the nutrients in his food. Total-Zymes® contain 14 plant-based enzymes to completely digest food and deliver all of the nutrients your dog needs. Each type of digestive enzyme only digests a specific type of food. For example, lipase only breaks down and digests fats (lipids). And bromelain breaks down proteins. But your dog’s food contains carbohydrates, sugars, fats, proteins and several other ingredients. This is why Total-Zymes® contains a proprietary blend of 14 different enzymes to digest and absorb all of the minerals, vitamins and other vital nutrients. To squeeze out every drop of nutrients from his food, Total-Zyme includes the proprietary Live Enzyme Activated Delivery System® (L.E.A.D.S.®). L.E.A.D.S.® is a proprietary system for guaranteeing the nutrients in the formula are absorbed and utilized at the cellular level. It is a unique blend of select enzymes, botanical and whole-food products. And works by delivering Total-Zymes® in a form that’s easiest and most efficient for your dog’s body to use. Order Your Dogs Digestive Health Products Through K9Medicinals.com or Our Sister Site at Dogcancer.net Today! Few things affect the health of your dog like a healthy— or NOT healthy— digestive tract. Make sure your dog has the support he or she needs to have the best chance for a healthy digestive tract with products from K9 Medicinals. For more information about our digestive products, please call us today!